Green "Billionaire's club" Conspiring to Save the Environment? Vitter alleges a "Billionaire's club" is conspireing to save the environment. Rather than a tool for open government, Vitter's Billionaire's Club report seems more like a distraction from the real billionaires in politics, major corporations and industrialists, with whose agenda David Vitter is strongly aligned. Interestingly, Vitter has ties to his own billionaires club, specifically the billionaire Koch Brothers. Sen. Vitter has vociferously supported the Billionaires, and was caught on camera saying: "I think the Koch Brothers are two of the most patriotic Americans in the history of the Earth… I’ll be honest with you, God bless the Koch brothers." According to ThinkProgress, the Koch brothers have blessed Senator Vitter right back. A review of campaign contributions finds that he and his leadership PAC have received at least $57,500 from the Koch brothers’ corporate political action committee - the same PAC that has been repeatedly accused of breaking elections laws surrounding money contributions. 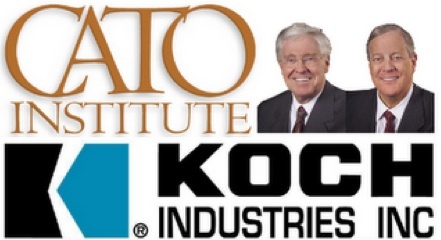 Besides the Koch brothers, Senator Vitter's largest political contributors are billionaire oil and gas interests. What the 92-page report leaves out is that Vitter — an esteemed member of the Senate “Millionaires Club” — owns tens of thousands of dollars in stocks of the electric utility Wisconsin Energy Corporation (We Energies), which owns major coal-fired power plants in both Oak Creek, Wisc. and Pleasant Prairie, Wisc. We Energies says it stands to lose economically if the proposed Obama EPA carbon rules are implemented, citing the potential risks related to legislation and regulation in its most recentU.S. Securities and Exchange Commission (SEC) Form 10-Q. Should there be less money in politics and more disclosure? Yup. Just funny to hear that from David Vitter. In fact there is a bill that Sen. Vitter could support, that would help reduce the influence of secret money in politics. Called the DISCLOSE Act, it seeks to reduce the torrent of dark money unleashed by the Citizens United v. FEC supreme court decision. However, the DISCLOSE Act would also force transparency on the Koch political giving machine, well known for obscuring the origin of political contributions. In spite of EPW's focus on Vitter's billionaire's club and political spending by environmental groups, Senator Vitter has refused to support campaign finance reform, or efforts aimed at reducing the wealthy's influence in politics, like the DISCLOSE Act. If the Senate was interested in uncovering secretive funding apparatus bent on twisting government policy to the detriment of people and their future, perhaps a look into climate change denial organizations would be a better use of tax dollars. A report by Drexel University's Robert Brulle found that 140 foundations funneled $558 million to almost 100 climate denial organizations from 2003 to 2010. This dwarfs most of the numbers used in Vitter's Billionaire's club report. However, Vitter has called climate change science “ridiculous pseudo-science garbage.” Perhaps Vitter and his staff should read Greenpeace's report on Koch funding of climate change denial, if he is so interested in secretive manipulations of politics. Billionaire's club.